I did a full review of Armani Luminous Silk foundation before in this post, but wanted to share some more swatches with you! I decided to TREAT my pro makeup kit to some of these beautiful babies. It was a little scary ($$$) but I bit the bullet and ordered. I love how the foundation looks on almost every skin type, so I knew it was time to splurge and add some of these to my kit. One thing that really surprised me when I became a full time makeup artist was how often I use the same 6 shades of foundation. By mixing in a lighter or darker shade, I can perfectly match every client from fair to deep. It’s pretty amazing, it honestly feels like magic every time. I think matching foundation might be my favorite part of doing makeup. 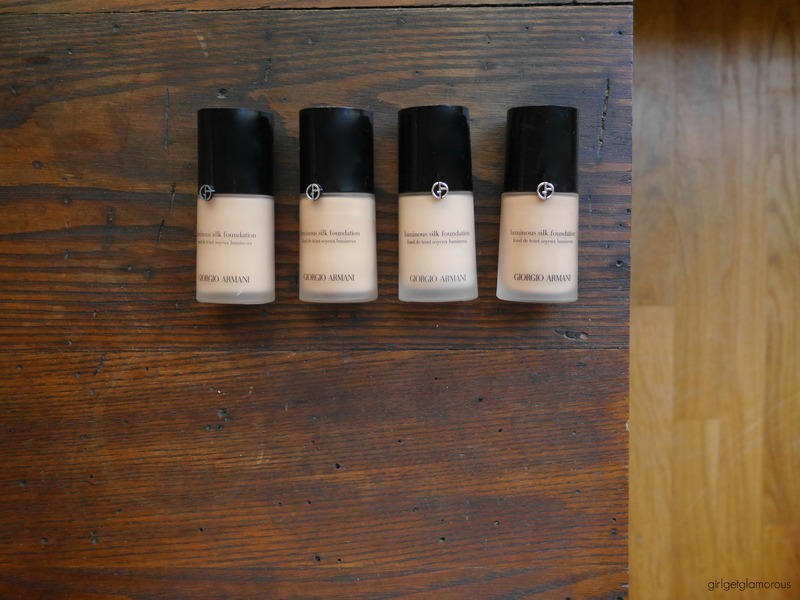 I want to eventually add a few more shades into my kit because this foundation looks great on every skin type, from dry to oily. For now, I picked up shade 4.25 (which I previously swatched), 4.5, 5, and 5.5. I also got deluxe sizes of the Maestro Skin Glow Foundation in 5 and the Fluid Sheer in 14. I haven’t really tried the Maestro foundation much, but the Fluid Sheer I’ve been wearing on my neck and chest as a body tint to blend that skin when I wear foundation. So far, I’m loving it. Gives a nice natural looking glow. Day Of Beauty at Ulta Beauty | Downey | Bonus – 21 Days of Beauty Picks! Cream Contour – Yep, It’s Rad.